Carob powder is a healthier alternative to cocoa powder. Carob powder, also called carob flower, is the chocolate color powder that is made from grinding roasted carob seeds. This powder is made from the fruit of the carob tree, a plant native to the Mediterranean area. These trees can grow to 55 ft. tall, and produce a large leathery fruit that is classified as a legume. These trees can be grown in most places that are well suited for citrus plants, but take fifteen years to establish themselves before producing fruit. These fruits are very sweet, containing about 40% sucrose. The pods that come from this tree have many uses throughout the food industry, especially in baking. Most commonly the seeds are roasted and ground into a dark brown powder resembling cocoa. The flavor, though nuttier and earthier, is also similar to that of chocolate. The texture of the powder when baked into items is also similar to that of chocolate. As a result, carob is a common replacement for chocolate in items that bakers desire to avoid negatives of chocolate such as caffeine content and presence of oxalates that have been linked to the formation of kidney stones and decrease absorption of calcium. Carob powder, which is slightly sweeter and lower in fat, can be substituted at a one-to-one ratio with chocolate in most baked goods. However, it is recommended that the amount of sugar is reduced and amount of fat added to compensate for the differences between the carob powder and cocoa powder. Carob is also used in place of chocolate to increase the nutritional value of products. Carob is high in many vitamins and minerals such as calcium and vitamins A, D, and B. It has also been proven to help with stomach pains and gastrointestinal discomfort. This powder is most commonly used as a chocolate substitute in baked goods, but can be used in some other ways. 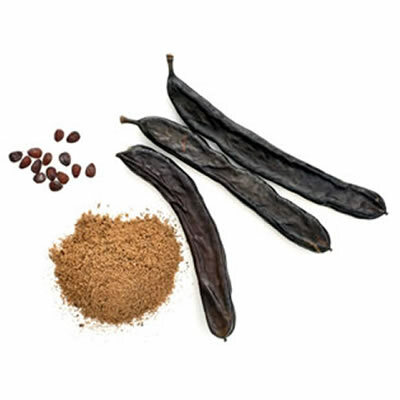 Given its sweet flavor, carob is used as a sweetener in breads, cakes, and candies. Carob powder can also be added to smoothies and yogurt to sweeten it and impart its unique flavor of carob. Carob powder is gluten-free, so it can be used in gluten-free products. Outside of the food industry, carob is also used in dog treats, and as a coloring and vitamin enhancer in cosmetics. Is Masa Flour the Next Big Thing? How Will the FDA’s Added Sugar Regulation Affect Your Bakery?